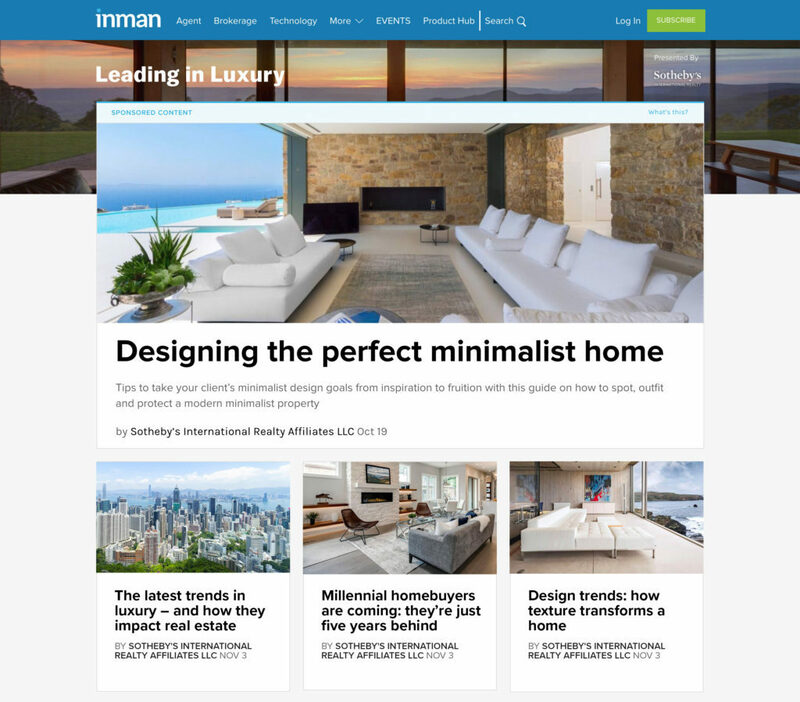 Launching today, Inman is proud to announce Leading In Luxury, a new sponsored section of Inman.com which brings Inman readers luxury lifestyle and creative insights into the latest trends from one of the world’s most respected luxury real estate brands, Sotheby’s International Realty. The new section will feature experts from Sotheby’s International Realty discussing trends, best practices and innovations in luxury real estate. Easily accessible from Inman’s homepage and top menu, Leading In Luxury will feature fresh content each week throughout 2019 to keep Inman’s readers ahead of the game in understanding the most creative, innovative and exciting trends in luxury real estate. Be sure to visit the new Leading In Luxury site every week to follow the most creative, innovative and exciting trends in luxury real estate, and to get insights from experts on where the luxury market is headed in 2019. Founded in 1976 to provide independent brokerages with a powerful marketing and referral program for luxury listings, the Sotheby’s International Realtynetwork was designed to connect the finest independent real estate companies to the most prestigious clientele in the world. Sotheby’s International Realty Affiliates LLC is a subsidiary of Realogy Holdings Corp. (NYSE: RLGY), a global leader in real estate franchising and provider of real estate brokerage, relocation and settlement services. The Sotheby’s International Realty network currently has more than 22,000 affiliated independent sales associates located in over 960 offices in 72 countries and territories worldwide. In 2017, the brand achieved a record global sales volume of $108 billion USD. Sotheby’s International Realty listings are marketed on the sothebysrealty.com global website. In addition to the referral opportunities and widened exposure generated from this source, each brokerage firm and its clients benefit from an association with the Sotheby’s auction house and worldwide Sotheby’s International Realty marketing programs. Each office is independently owned and operated.